Consistent, deep practice is the rocket fuel of musical development. When we live by regular practice schedules we reap countless benefits. Here are 6 major ones. See The Musician’s Way for specific strategies to maximize the productivity of your practice. Our devotion to practice sharpens our artistic insight because our creative faculties get ongoing exercise. During the periods between practice sessions, we know when we’ll practice next, which helps us keep our musical goals in mind, adding to our creative energy. When we know that specific times are set aside for practice, we can better pace our learning. Consistent practice enables us to be maximally productive day after day. The productivity we gain bolsters our success and amplifies our motivation to work. Because we carve out periods to practice, we can also set aside time for self-care, relationships, career development, and more. As a result, we grow as artists and live balanced lives in the process. 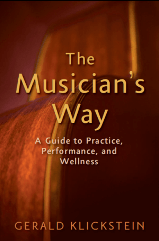 For tools to help schedule, organize, and evaluate practice, explore the free music practice tools at MusiciansWay.com. I appreciated that article and I’ve really seen the value of point #1. While I have made it a point to practice some everyday, I haven’t really blocked out specific times each day to do it. I see now it will be better to schedule specific times rather than just grab some time during the day. Thanks, Ken. Let me know how your new schedule works for you. After more than a decade as a freelance composer, I’m still experimenting with what consistent ‘practice’ means for my work. For me, the biggest benefit of scheduling pure composing hours is just protecting them (otherwise that time could be sucked into the admin vortex — planning, grantwriting, responding to emails, etc.). My favorite of your points here is #2, Energy. Knowing when the next real-work block is coming does illuminate (and even ‘creative-ize’) the admin work. Hi Kala – Thanks for dropping by and sharing your thoughts. I echo your point about the importance of reserving creative time. When we commit ourselves to work at specific times, we establish a regular rhythm that feeds our creative powers. Thanks for contributing, Mike, and for your kind words! As you eloquently describe, consistent practice brings rewards beyond measure and makes it possible for us to enjoy lifelong musical community. I read this article as I was reflecting on my new practice schedule and how much I have improved lately because of it. I block out time and to practice drums each week and I really look forward to it. The times in my life where I wasn’t practicing consistently, my skills suffered. I want to keep growing as an artist so I can have deeper musical conversations with other musicians when I perform. Thanks for all that you do Gerald. YOU ROCK!